Alex Housman is a kid who at the age of sixteen has had fourteen cars, harbors many hurts, and seems to fade into his environment while raging inside. His father is an alcoholic, losing his grip on life even as he wants the best for his son. This novel explores Alex's transformational journey, as well as his not-so-conventional relationship with his father. It is very rare for me to be able to sit down with a book that deals with a pretty heavy subject matter, and come out of it having actually felt like it was worth reading. 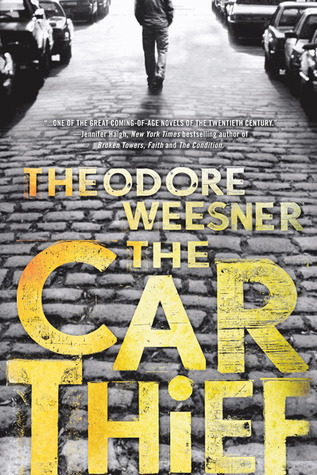 The Car Thief was definitely a lot more serious, and more densely written, than most of the books I’ve been reading lately. But I think, for me, it was worth the time and effort that I invested in reading it. Honestly, it was very difficult for me in the beginning. It took a bit of time for me to be truly interested in the story, especially because I was definitely not used to the way the story was written. However, about a third of the way into the book, I found myself quite intrigued by the book. I actually wanted to continue reading the book and find out what happened to Alex, the main character. The second part is where the book takes on a whole new tone when we accompany Alex on his stint in juvie. I think it’s an interesting change in pace for the novel, and I was quite curious about the picture the author painted. While it certainly was not pleasant at points, it was quite... eye-opening. I don’t know exactly how accurately it was portrayed, but it definitely was something else. And the third, final part was what happened after Alex gets out of juvie. It was very well-done, at least to me, because Alex wasn’t perfectly rehabilitated. He still made mistakes and messed up a couple of times. What had changed was his attitude towards his life and future. The tenacity and the drive with which he attacked the things he needed to get done in order to change was totally inspiring. And I definitely wanted him to succeed! The situations he had to deal with at home and even among his peers were challenging, but he handled them as best he could. While I certainly had my reservations when I started this novel, I’m happy to say that I really did end up liking it in the end. It’s an incredible journey that Alex goes on. Because I felt like I really got to know him, I liked reading about him and I went from feeling apathetic about him to really rooting for him to succeed. I certainly don’t think this novel is for everyone; but it’s definitely for those who like heavier, darker and denser reads. I can be quite reluctant to pick up books that deal with heavier subjects too, but I do enjoy them occasionally. I'm glad this was a good read for you in the end. Lovely review, Alexa! This sounds like an interesting book. I like how it's written in three parts about the boy's life. The Car Thief sounds interesting, but honestly I'm not really into dense sorts of books lately. ALTHOUGH the bits about Alex changing so much and developing as a character sound good, I just don't think this is a me sort of book. I did like your review though and if I was into dense right now I'd totally read this!